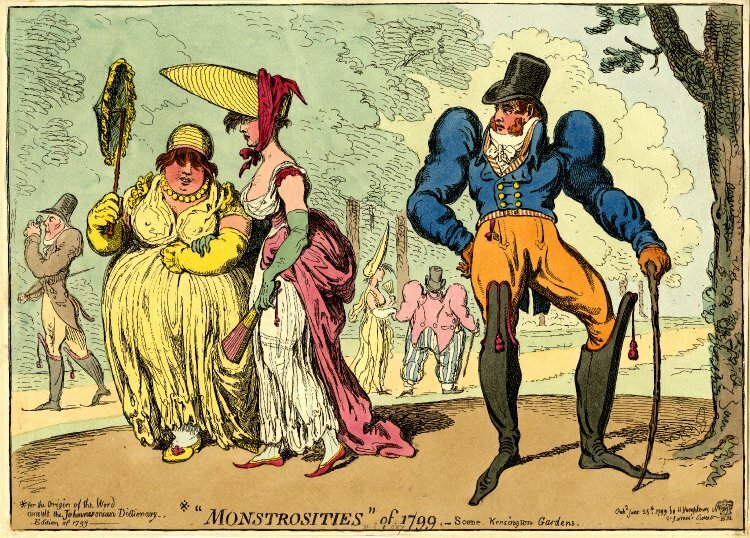 In my previous post on James Gillray, I looked at “Monstrosities” of 1799 – Kensington Gardens, a copy of which was given to me for a recent birthday. One of my kind benefactors asked how people would have bought copies of such prints. 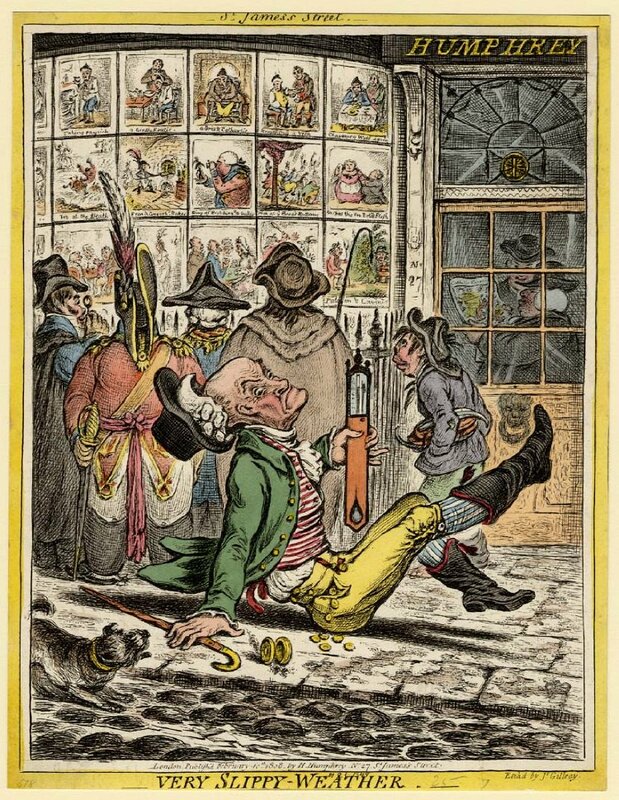 Here I outline some of the aspects of the satirical print business, including information about Hannah Humphrey, who published Gillray for most of his life. It is not a long journey from the satirical prints of Hogarth, Gillray, Rowlandson, Cruikshank to the cartoons of Steve Bell, Martin Rowson, Ben Jennings and others. But while the work of the latter is published in newspapers (and online of course), this distribution channel was not available in the 18th and early 19th centuries. 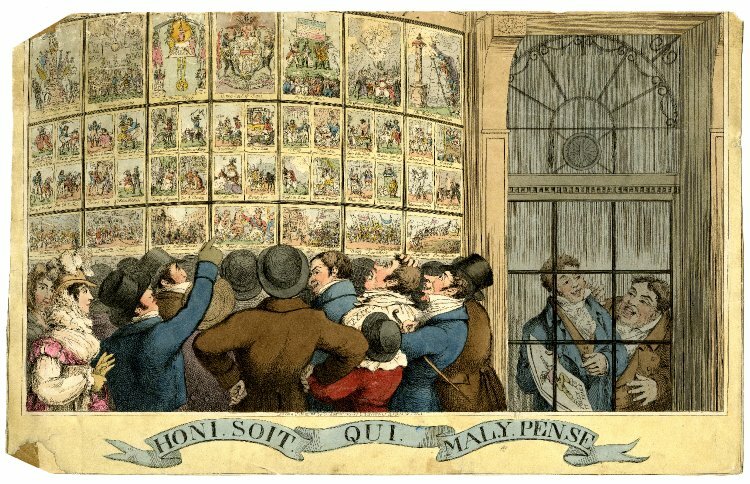 Instead, prints were usually sold singly in dedicated print shops in the West End of London. There were also dealers in the area around St Paul’s in the City, but I will confine this post to those in the West End. Not all print shops dealt exclusively in engravings – books and maps were often also sold. Among the most important dealers was Samuel William Fores, a Scotsman initially based in Piccadilly and from 1795 at the corner of 50 Piccadilly1 and Sackville Street, where windows on two sides of his premises allowed him plenty of space to advertise his wares. Although Fores sold the work of many artists, his most significant client was Isaac Cruikshank. Fun fact: For a while, Louis Philippe, duc d’Orléans, who went on to become King Louis Philippe I, lodged on the first floor, above Fores’ shop. One of Fores’ direct rivals was William Holland, whose shop was located from 1782 at 66 Drury Lane and from 1788 at 50 Oxford Street. Gillray was initially among Holland’s artists until he was aligned exclusively with Hannah Humphrey. 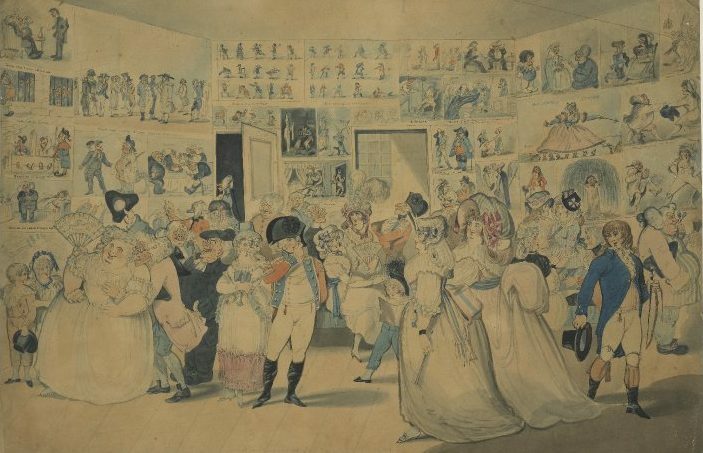 In 1793 Holland was imprisoned for selling a work by the radical Thomas Paine. 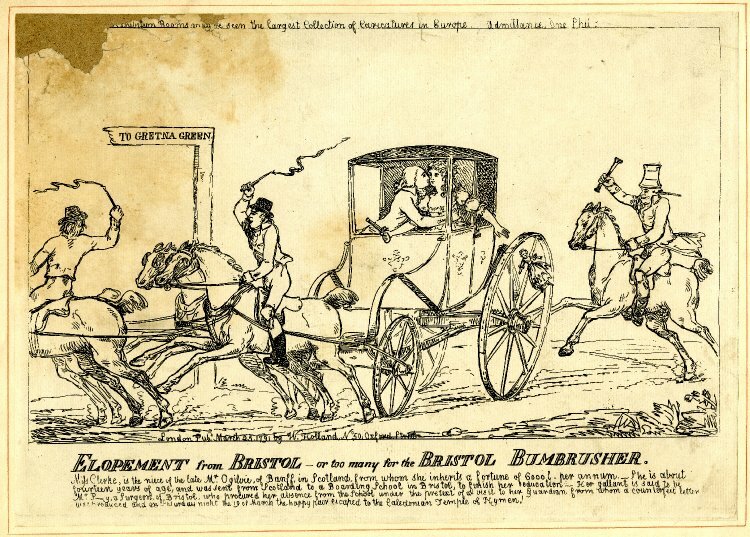 Unlike Fores and Holland, and later Rudolph Ackermann in the Strand, Hannah Humphrey (1745–1818) specialised in satirical prints – that is all she sold. She had inherited the business from her brother William when it was based in St Martin’s Lane and moved it first to Old Bond Street and subsequently to New Bond Street and then to 27 St James’s Street. Humphrey was that rare beast: the Georgian independent businesswoman. 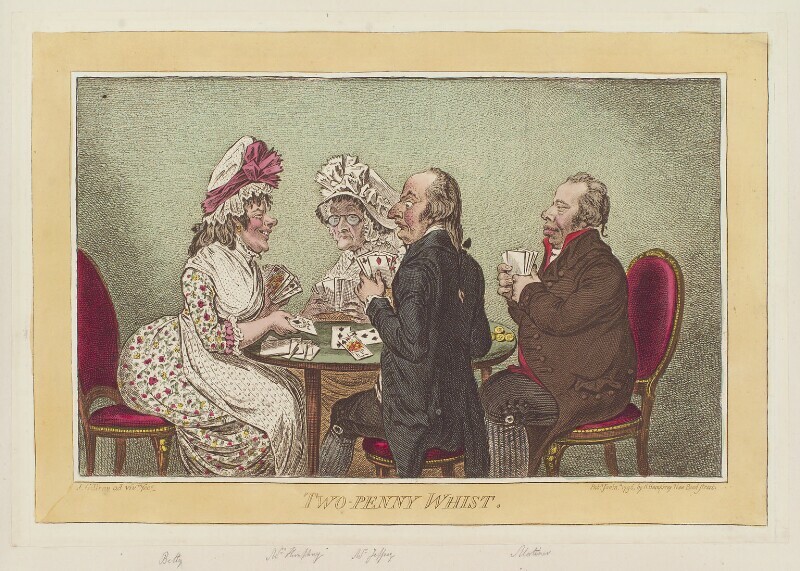 Gillray lodged with Humphrey for twenty years and although some suspected an illicit relationship between these two single people it was in all probability platonic. They were clearly friends. When Gillray developed poor sight and descended into mental illness and alcoholism at the end of his career and was no longer able to work, Humphrey cared for him until his death. 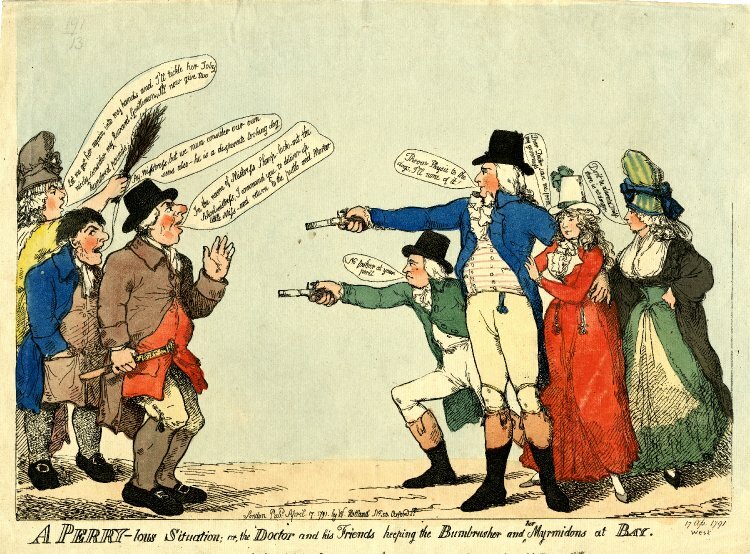 Anon., A Perry-lous situation; or, the doctor and his friends keeping the bumbrusher and her myrmidons at bay (1791). Published by William Holland. 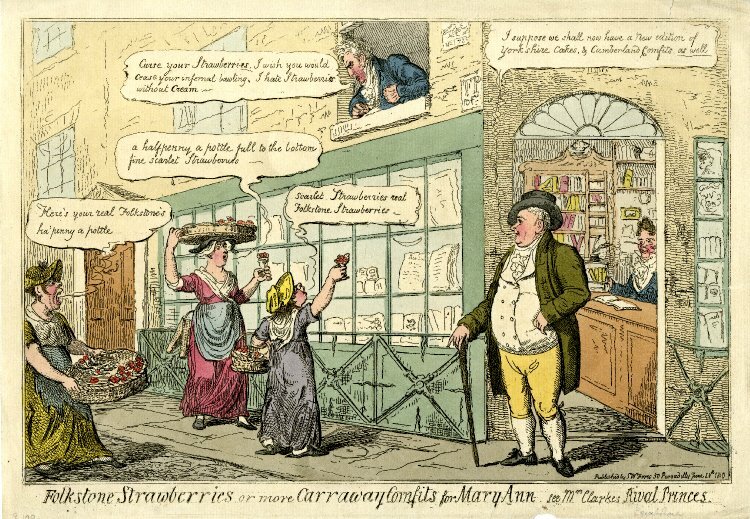 An 1821 caricature of Humphrey’s shop on St James’s Street. The figures seen through the door on the right are thought to include George Humphrey. Later renumbered as 41 Piccadilly. I wrote about this notorious case in 2013. Acknowledgement: The work of Mathew Crowther at The Print Shop Window, Heather Carroll at The Duchess of Devonshire’s Gossip Guide to the 18th Century and Robert L. Patten, Conventions of Georgian Caricature. Art Journal, Vol 43, Winter 1983, pp. 331-338 has been helpful in writing this post.